I’ve always thought being a stuntman would be a bit like being a spy, specifically James Bond. You get to meet interesting people, travel to exotic locales and do exciting and dangerous things without anyone knowing it’s you. You’re constantly in peril and you have to wear a disguise. It’s exactly like being a spy. Only, according to veteran stuntman Vic Armstrong, much, much cooler. Vic has been doing stunts in movies and on television since the 60s and the list of projects he’s been involved with is impressive. He’s been Indiana Jones, James Bond, and even Superman. He gets to play all the best characters, even though no one knows it’s him. Reading his stories about his time on various sets and the challenges of being a stuntman is a behind-the-scenes look at some of the biggest movies ever made. What stands out isn’t that he got to be these amazing characters, or that he hung around on set with people like Arnold Schwarzenegger and Steven Spielberg, but that he has such an enthusiastic passion for his work. A story like Vic’s could easily take one of two directions. It could become just a list of things he’s done and places he’s traveled or it could become nothing but a series of name drops. This book is neither of those things. As Vic describes his experiences he infuses his stories with the genuine excitement he has for being a part of the creative process. It’s not so much that he knows Spielberg, but that he had the privilege to work with Spielberg and to grow and learn from the experience. Despite his impressive resume, there is something humble about his obvious love of his work. And with such an impressive resume, everyone is sure to find an action scene or two that they remember being amazed by in a theater that Vic made possible. Knowing some of these scenes so well as a fan, like Indiana Jones jumping onto that tank, and then reading Vic’s description of how it all happened makes it very real. You can see it in your mind’s eye with a new appreciation for just how difficult a stunt was to pull off successfully. To complement his stories, the book is full of black and white shots of Vic on sets, performing stunts and with some bona fide movie stars like Christopher Reeve and Harrison Ford. Some of those stars are even quoted in paragraphs showing their appreciation of how Vic made them look like they were doing a heck of a lot more than they could have managed alone. There’s also a section of full-color pictures including one of him next to Harrison Ford as Indiana Jones that will have you looking twice to see who’s who. 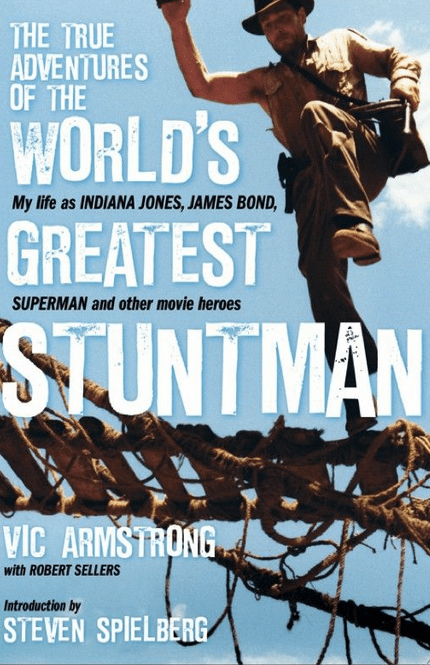 The True Adventures of The World’s Greatest Stuntman ($14.95) is both the story of stuntman extraordinaire Vic Armstrong and a behind-the-scenes look at some of your favorite movies that is sure to make any movie buff smile.